I’d like to introduce you to the sixty-seventh interviewee in my ‘Meet the Author’ series. He is Mike Nettleton. Hi, Mike! Welcome to Susan Finlay Writes blog site. Can you tell us a bit about your background as a writer? My friends from elementary school days tell me it was no surprise to them that I became a writer, since I was making up stories for as long as they could remember. I learned how to write news and ad copy during my career as a radio personality. When I met Carolyn Rose in Albuquerque, and we began our nearly 30 year relationship, we both expressed our desire to improve our writing skills. We took classes from Elizabeth Lyon, a gifted book doctor headquartered in Eugene, Oregon and started our first novels. I was lucky enough to win the Pacific Northwest Writer’s Association’s short story competition a couple of years in a row, which gave me the confidence to tackle subsequent novels. You wrote a hard-boiled mystery, The Shotgun Kiss. Can you tell us about the book? What inspired you to write it? Two things: I wanted to bring the unique world of New Mexico to life on the page. I love books with a strong sense of setting. Secondly, I became interested in the concept of obsessions and their destructive impact on people. Neal Egan is a man who can’t rid himself emotionally of the beautiful woman he married and divorced after he caught her cheating on him. The murder of her abusive lover and Neal’s reluctant role in trying to clear her of the crime leads him on a journey of self-realization and recognition of the true nature of mature love. You’re working on your third screenplay. Can you tell us about it? Can you tell us about your other screenplays? I have a life-long love of the movies. I had read Syd Field’s Screenplay and William Goldman’s Adventures in the Screen Trade and several other books on the craft. When Cynthia Whitcomb of Willamette Writers, a successful screenwriter (Buffalo Girls, Selma, Presumed Guilty), offered 8 weekly sessions, I enrolled. In the course of her class, I finished a screenplay adapted from the young adult fantasy novel Carolyn and I had written, The Drum Warrior. Subsequently, I adapted on of Carolyn’s books (my personal favorite), An Uncertain Refuge. I ‘ve entered both screenplays in competitions and continue to search for ways to market them. I’m at work on the third screenplay, tentatively titled Bait and Switch, a buddy movie featuring a private detective and his cross-dressing buddy. You’ve co-authored several mystery novels with your wife, Carolyn J. Rose. What is it like to write with a partner? How does that work? Do you ever disagree about something in a story? No way to pull punches on this one. Writing collaboratively can get tense. Until we established some ground rules, we didn’t get much done. Our method involved someone taking the lead on the story, based on ideas we’d brainstormed (usually in the car on long drives) and writing the initial pages. The other person would take the printed pages, add, subtract, question and expand with pen, and ink on the pages, or if necessary, create new segments on their own computer and print them. The whole meshuggah goes back to the first writer who incorporates (or doesn’t) the revisions. When we disagreed, we negotiated, wheedled, whined, begged, threatened and pouted. (Actually the last five were just me). Here’s where another rule comes into play. The person who takes the lead, has the final say on what stays and what goes. Writer 2 never, never, never gets to work on the master version. Your website says you and your wife plan to revise and self-publish some of your books that were with small presses. What made you decide to do that? We had a parting of the ways with one small Oregon-based publisher. We’d ended another writer/publisher relationship amiably years before. With the growing name recognition of Carolyn’s work we thought repackaging the books might lead to reaching more readers. Two of the books, The Big Grabowski and Sometimes a Great Commotion will return to their original titles Death at Devil’s Harbor and Deceit at Devil’s Harbor. We thought the titles more accurately convey the cozy mystery genre. Both books will feature new covers (created by Dorion Rose, whose work we love) and have been re-edited and spiffed up. The two earlier books The Hard Karma Shuffle and The Crushed Velvet Miasma will retain their titles. A decision on cover art remains an ongoing question. We’ll also rework them a little. One positive about going back to your older books is being able to apply the craft we’ve learned since initially writing them. Would you share a brief excerpt from one of the books? Sure: Here’s a little something from The Shotgun Kiss: (Formerly Shotgun Start) In this early chapter, Neal Egan’s friend and sometimes business partner Cepeda Mondragon delivers the news that Neal’s ex-wife is suspected of murdering her lover. He narrowed his eyes and I knew what he was thinking. Of all the people who might have wished Turk Tejada dead, I had the best reason. You also do writing presentations and workshops. Can you tell us more about these? Do you and Carolyn do them jointly, or you do teach different segments? We double-team most of them, although we have presented individually. Topics range from constructing a mystery novel to using setting to sharpen character to why active language is important in storytelling. Much of our material is drawn from our years of teaching The Novel Writing Bootcamp at Clark College. We try to make all of our workshops and presentations interactive with exercises that illustrate the points we’re trying to make. Least favorite thing? Getting my rear end into the chair in front of the computer. As the man known as HE OF SHORT ATTENTION SPAN, I will play golf, shoot pool, vacuum, cook a five course meal, write to faux Face-Book friends or nap leaning against a wall to avoid writing. Once I get my fingers moving on the keyboard, I’m fine. Favorite thing? That moment when you finish a first draft. I really like rewriting. I view it as an opportunity to polish the story to a brilliant sheen. My best writing is almost all generated in subsequent drafts. Of all the books you’ve worked on, do you have a favorite, and if so, which one? I’m amazed, in my reworking of our past collaborative books, that they can still make me laugh aloud. So that’s gratifying. If I have a favorite, it’s probably The Drum Warrior because the roots of the story came from an incident im my childhood. What do you like about writing mysteries? I read a lot of them when I was young. Erle Stanley Gardner, Rex Stout, Raymond Chandler and John (and Ross) McDonald. They appealed to me because they are puzzles, reveal the dark side of human nature and took me to worlds that were not my own. Crafting them yourself and trying to create believable characters and intertwine plot twists is a constant challenge. When you pull it off, it’s fulfilling. Who are your favorite authors? Did any of them inspire you to write? The list would be huge as I am a life long bookworm. Early on, along with the mystery authors I named, I loved Ray Bradbury. He had a knack for drawing on his memories for inspiration for short stories. Recently I’ve been reading a Norwegian author Jo Nesbo, whose writing style is vivid and compelling. Carolyn and I read a ton of U.K. based mystery authors including Ian Rankin, Colin Dexter, Martha Grimes and the late, lamented Reginald Hill. Thanks to Susan for the chance to be a part of her blog. I’ll be around off and on during the day, but head off to rehearsal for The Importance of Being Earnest tonight. Mike N.
It was my pleasure interviewing you, Mike. This was an interesting interview because it gives insight into how two authors (especially married authors!) work together. Especially fascinating is the rule that the secondary author never, never, never makes the final decisions on a given book. 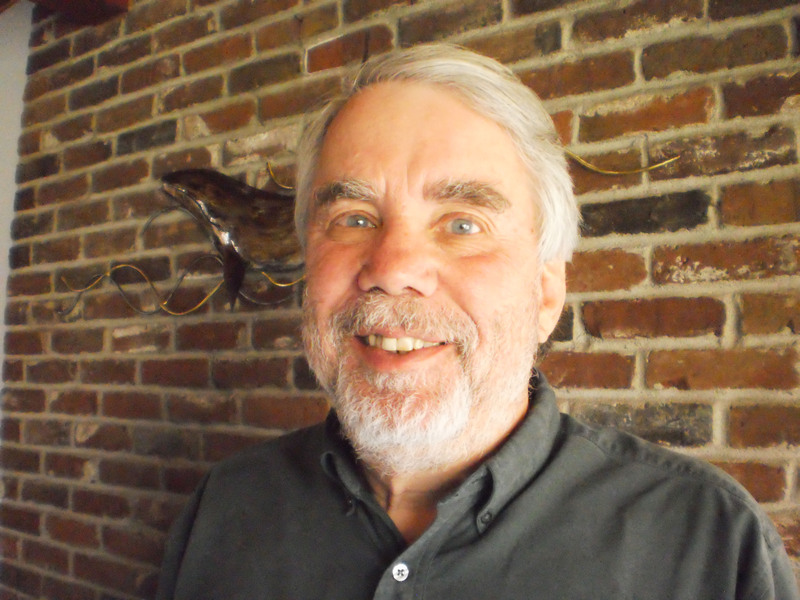 Leave a reply on "Meet the Author: Mike Nettleton"